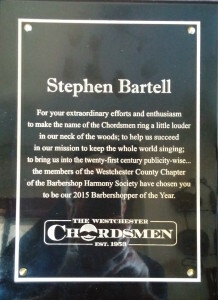 Congratulations to Stephen Bartell, who was awarded the prestigious title of “Barbershopper of the Year.” His dedication to our chorus, hard work at promoting and marketing the Chordsmen, and his yeoman’s job on our recent publication of The Overtones, is just a sampling of the work Stephen has brought to the health and wellbeing of the Westchester Chordsmen. 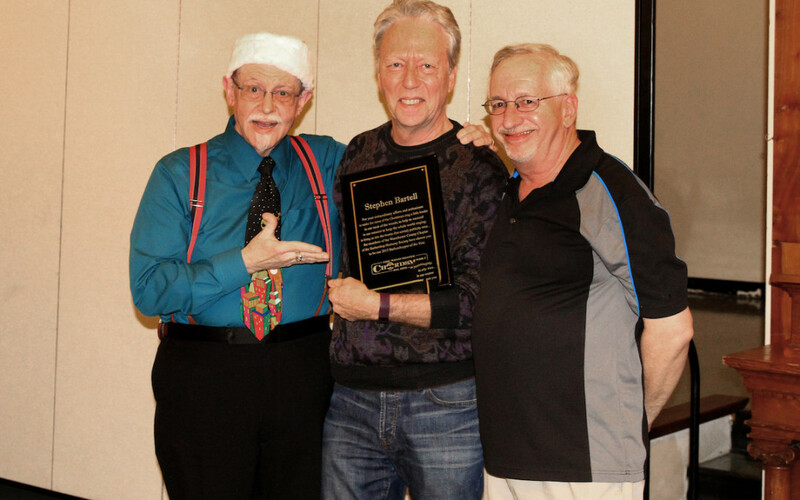 For your extraordinary efforts and enthusiasm to make the name of the Chordsmen ring a little louder in our neck of the woods; to help us succeed in our mission to keep the whole world singing; to bring us into the twenty-first century publicity-wise… the members of the Westchester County Chapter of the Barbershop Harmony Society have chosen you to be our 2015 Barbershopper of the Year. Well deserved, Stephen! Thank you for all you do!